The commemorative Luxembourg stamps of 1922 to 1939 feature the World's first souvenir sheet, philatelic exhibitions, and Luxembourg's independence as a sovereign Grand Duchy, in the aftermath of the Belgian Revolution. The 10 F. denomination souvenir sheet shown above was issued on January 3, 1923 to celebrate the Birth of Princess Elizabeth. This was the first 10 F. denomination postage stamp produced in Luxembourg. 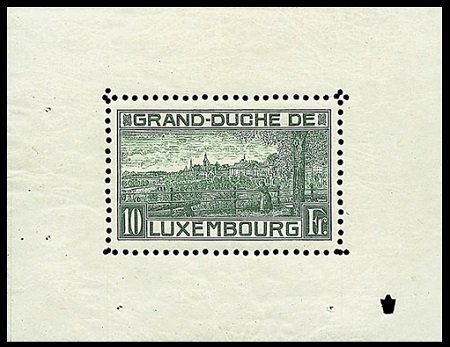 The design of the 10 F. denomination stamp features a View of Luxembourg City from the park in front of Fort Thüngen. This is officially considered to be the World's first philatelic souvenir sheet or miniature sheet. Earlier Luxembourg miniature sheets were sold in 1906 and 1921, however those sheets contained contemporary definitive postage stamps that were readily available for purchase at post offices. Princess Elizabeth (1922-2011), the Duchess von Hohenberg, was born on December 22, 1922 to Grand Duchess Charlotte of Luxembourg and Prince Felix of Bourbon-Parma. 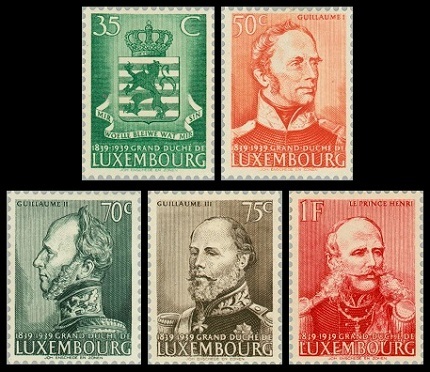 The six commemorative Luxembourg stamps shown above (Sc. #200-205) were issued on August 26, 1936 to publicize the 11th Congress of the International Federation of Philately (FIP). The common design of the stamps features the Municipal Palace in Luxembourg City, where the FIP Congress was held. 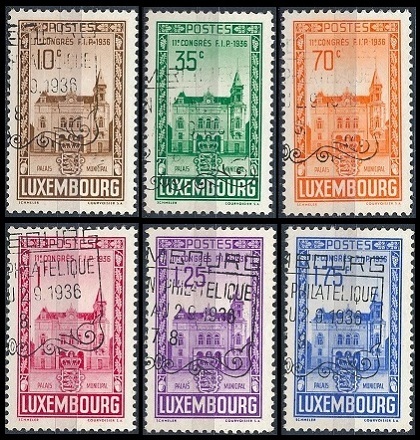 The ten Luxembourg stamps shown above were issued on May 27, 1939 to commemorate the 100th Anniversary of Luxembourg's Independence. 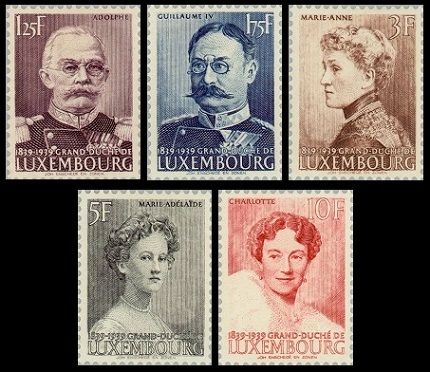 The designs feature portraits of the Grand Dukes and Grand Duchesses that have ruled Luxembourg between 1839 and 1939. 35 C. (1939 - Sc. #206) - Arms of Luxembourg. 50 C. (1939 - Sc. #207) - Grand Duke William I (Lived: 1772-1843, Reigned: 1815-1840). 70 C. (1939 - Sc. #208) - Grand Duke William II (Lived: 1792-1849, Reigned: 1840-1849). 75 C. (1939 - Sc. #209) - Grand Duke William III (Lived: 1817-1890, Reigned: 1849-1890). 01 F. (1939 - Sc. #210) - Prince Henry (Lived: 1820-1879, Governor of Luxembourg: 1850-1879). He was the Brother of Grand Duke William III. 01.25 F. (1939 - Sc. #211) - Grand Duke Adolph (Lived: 1817-1905, Reigned: 1890-1905). 01.75 F. (1939 - Sc. #212) - Grand Duke William IV (Lived: 1852-1912, Reigned: 1905-1912). 03 F. (1939 - Sc. #213) - Regent Marie Anne (Lived: 1861-1942, Regent: 1908-1912). She was the wife of Grand Duke William IV. 05 F. (1939 - Sc. #214) - Grand Duchess Marie-Adelaide (Lived: 1894-1924, Reigned: 1912-1919). 10 F. (1939 - Sc. #215) - Grand Duchess Charlotte (Lived: 1896-1985, Reigned: 1919-1964). The commemorative Luxembourg souvenir sheet shown above (Sc. #217) was issued on December 20, 1939 to celebrate the 20th Anniversaries of the Reign of Grand Duchess Charlotte and of the Grand Duchess' Marriage to Prince Felix of Bourbon-Parma. 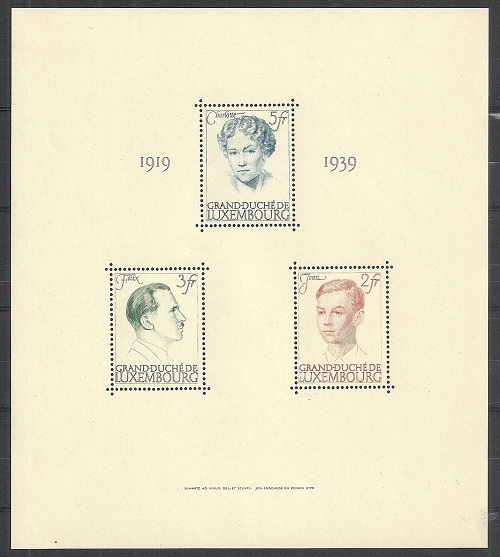 The three stamps in the souvenir sheet feature contemporary portraits of Grand Duchess Charlotte, Prince Felix of Bourbon-Parma, and Prince Jean. The 25 C. and 30 C. denomination definitive stamp types of 1921 (Sc. #149-150) were issued imperforate on August 27, 1922 for the Luxembourg Philatelic Exhibition. These stamps are very different than the regularly issued definitive postage stamps. They were engraved on laid paper, and they are imperforate. These stamps were only available for sale at the philatelic exhibition in August 1922. The 2 F. denomination commemorative Luxembourg stamp shown above (Sc. #216) was issued on September 18, 1939 to celebrate the Elevation of Mondorf-les-Bains to Town Status. The design features an Allegory of Medicinal Baths. Mondorf-les-Bains is a spa town in Luxembourg. Though the town has been around for centuries, under other names, the mineral springs were not discovered until the 19th Century, as the result of a construction project. Mondorf-les-Bains is also the only town in Luxembourg with a casino.